A mobile computed tomography (CT) scanner – significantly smaller than standard machines – may one day help doctors diagnose traumatic brain injury in patients on site, from football stadiums to the front lines of combat. CT is an excellent method for detection of traumatic brain injury such as bleeding in the brain, but standard CT scanners are quite large, so patients must be brought to the machine to undergo testing, which delays the potential diagnosis. As discussed at AAPM 2015 July 12-16 in Anaheim, California, researchers at Johns Hopkins University developed a prototype mobile scanner based on improved, high-quality-image cone-beam CT that could overcome logistical issues and be used to quickly assess whether a patient has suffered a traumatic brain injury. Among the many potential uses: in the intensive care unit (for bed-ridden patients who cannot risk transfer to a CT scanner), at urgent care and concussion clinics, in ambulance and mobile clinics, at stadiums and other athletic venues and in the military theater. 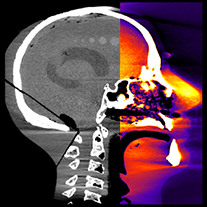 X. Wang, Ph.D., Research Scientist, Carestream Health, Rochester, N.Y.
July 18 - AAPM: Mobile CT Scanner Could Help Diagnose Brain Injury on the Spot. Appl Rad Oncol.